Home » Give Cutter Membership a Try! Cutter Consortium Membership — available in several different variations — opens up multiple avenues to interact with Cutter’s experts. ► Get coaching and insights on leadership and team-building practices that boost productivity. Like everything business-technology, one size does not fit all. That’s why we encourage you to choose the Membership level that’s right for your organization. I have personally been able to leverage Cutter’s services since 1999. Among the attributes that differentiate Cutter, two remain at the top of my list — Thought Leadership and Real Value — executed in a practical way. 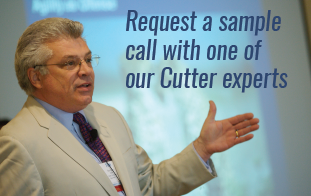 Thought Leadership is driven by Cutter’s experts. The advantage is that Cutter doesn’t pitch a single best practice for a given area. Instead, Cutter provides multiple good practices/options that come from both academic rigor as well as on-the-ground experience.